You might not be familiar with this term, as it has only been invented by Aaron a few years ago. 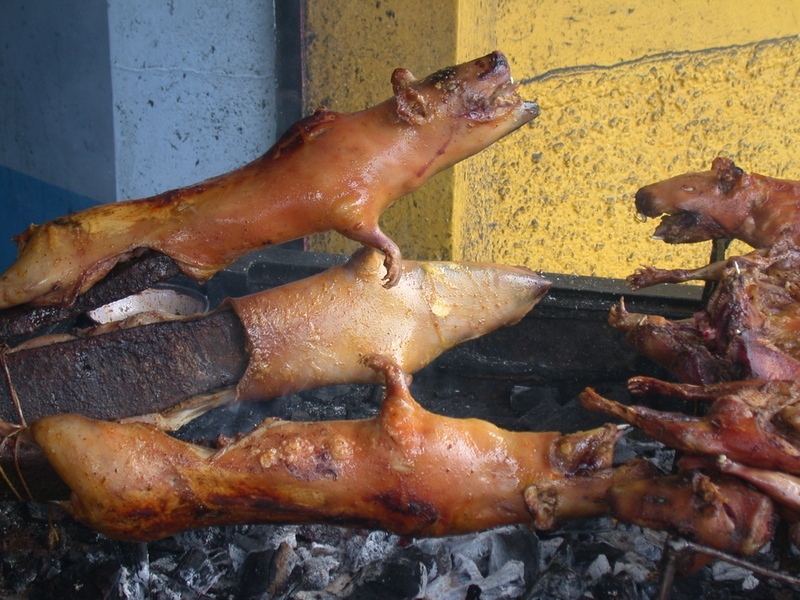 In Ecuador one of their favorite delicacies to eat is roasted guinea pig. In Ecuador they are called “cuy”. They are served in fancy restaurants as well as on the side of the road. People sometimes raise them in their kitchen like pets and then save them for special occasions. One time while driving down the street we saw several cooked cuys for sale alongside a giant roasted pig. Aaron decided that cuy would more appropriately be named “puerqueño” which is a combination of “puerco” (pig) and “pequeño” which is small. And thus it was that “puerqueño” was born, which would make most of our Ecuadorian friends laugh, and would eventually become everything from Halloween costumes to our family’s name. 6 Responses to What’s a Puerqueño? I can’t believe there aren’t multiple comments here about how disgusting those roasted mini-pigs are. I have eaten a bite of one, and of course that was enough and I will never do it again. But come on here people, make a comment on how awful that photo is. This is not a joke, it’s ROASTED Puerquenos! GROSS!!!!!!! Those little burnt ears, noses and eyeballs have cured all hunger pangs brought on by Pinterest. Thank you. Why did I just see this comment now? Ahahaha!! !